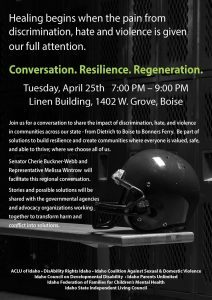 The Idaho Coalition Against Sexual & Domestic Violence, the Idaho State Independent Living Council, Idaho Council on Developmental Disabilities, DisAbility Rights Idaho, Idaho Parents Unlimited, Idaho Federation of Families for Children’s Mental Health, and the ACLU of Idaho are collecting stories from around the state on the impact of discrimination, hate, and violence in our schools and communities and to generate solutions on how we can create communities and schools where everyone is valued and safe. Share your story and solutions for communities and schools where everyone is valued and safe below. I would like my story to be shared anonymously. We are dedicated to treating your personal information with care and respect. If you have chosen to have your story remain anonymous, we will remove all identifying information prior to sharing. Updates regarding this and other related issues will be sent by email (including to anonymous submissions). If you elected to share your story including your personal information, you may also be contacted as a follow-up to your stories and solutions submission. You may remove yourself from the mailing list at any time.